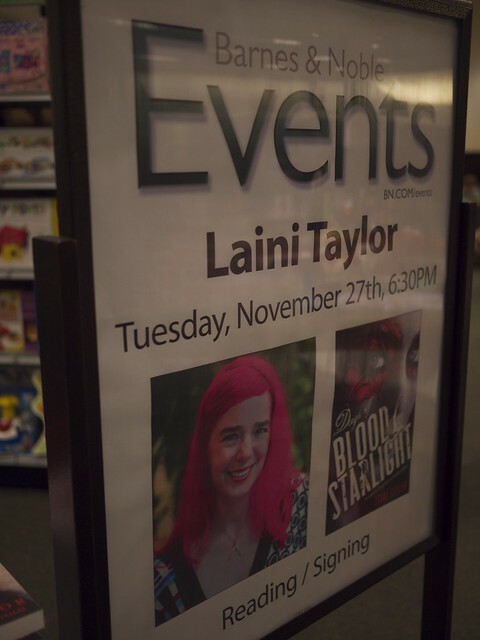 Laura, Sandra and I had great fun meeting up with our blogging friend Flannery from The Readventurer, who drove down from Seattle to see Laini Taylor speak at our local Barnes & Noble earlier this week. This BN actually has a great YA section, one of the better ones in town, actually. However, they’re not so great at organizing events. 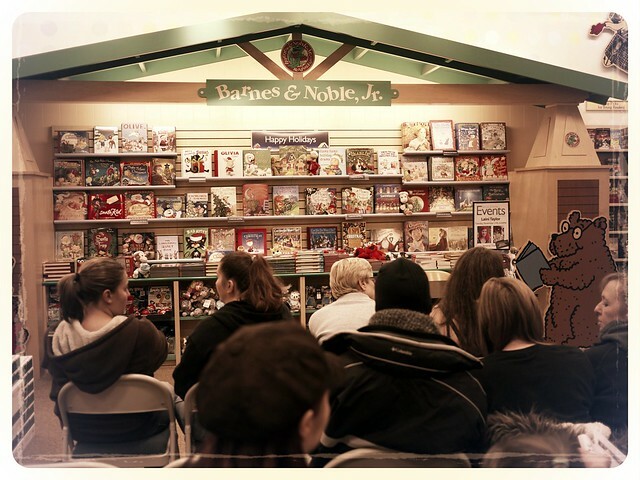 For example, this is a two-level store, but there was no signage indicated where the reading/signing was in the store, just that it was happening. 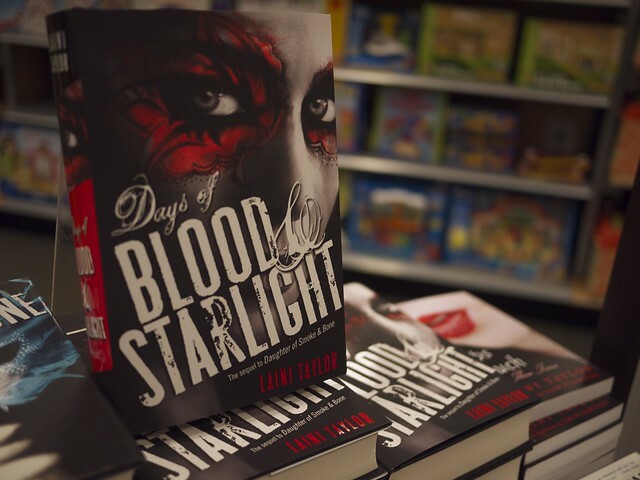 I got the impression that the staff at this store didn’t realize that Laini is a pretty popular author, nor that Days of Blood & Starlight was one of the more anticipated YA books of the year. 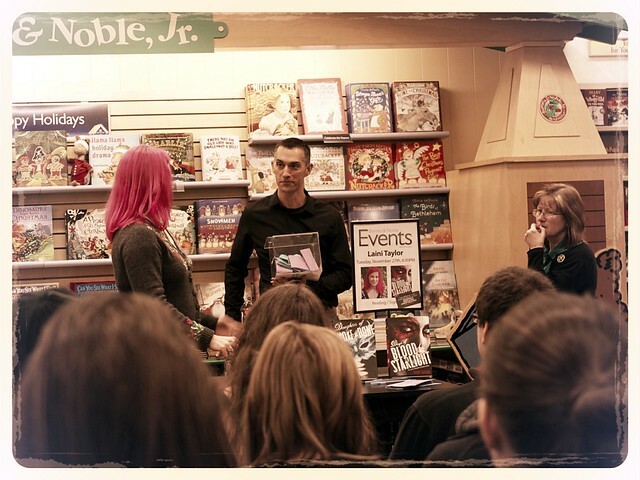 They didn’t have a lot of chairs and didn’t direct people to enter the drawing for what looked like some cool prizes of Daughter of Smoke & Bone jewelry. 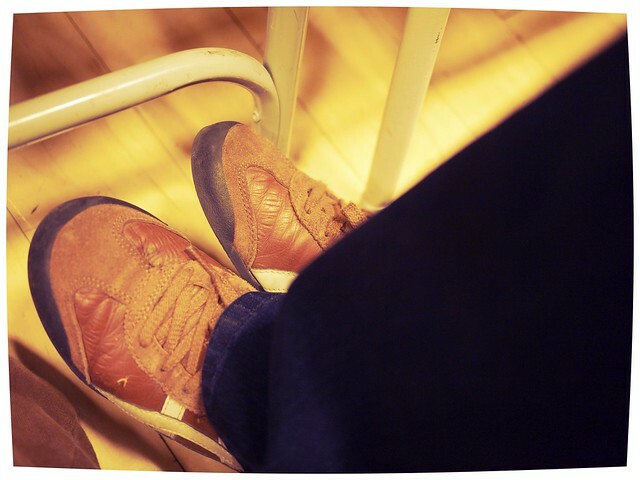 Laura is not wearing flipflops, guys! Stop the presses! 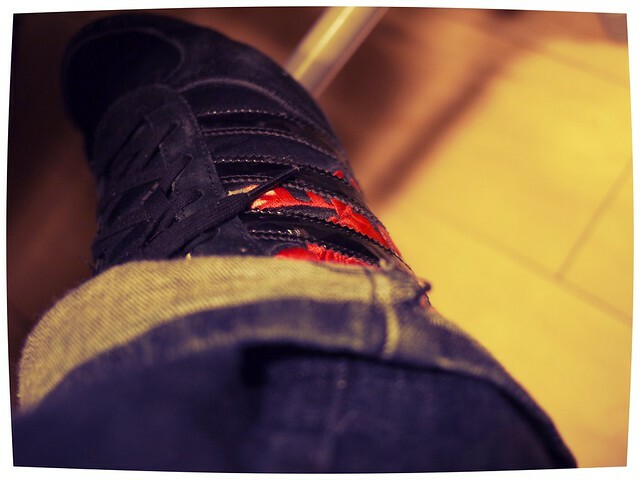 My shoes. These are ancient, Spain-themed sneakers. The potential movie screenwriters are struggling with the ended flashback section in the first book, since it’s an unconventional approach. 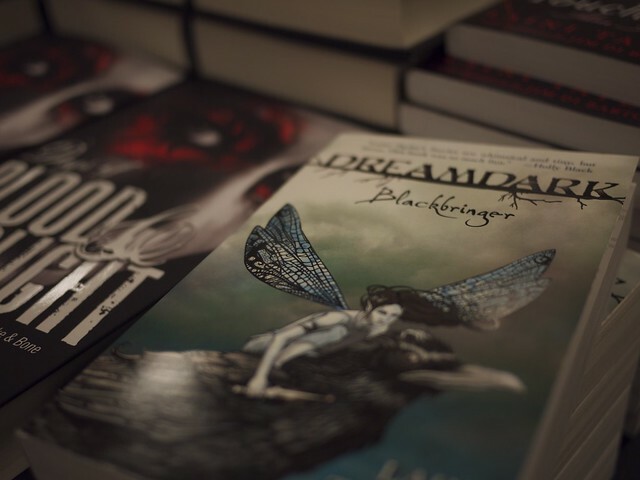 Sandra really loved Blackbringer, and Laini recommends is for younger readers who aren’t ready for the intensity of the DoSaB series. She also said that she and her husband, Jim Di Bartolo, would like to collaborate on a graphic novel for children sometime. How cool would that be? 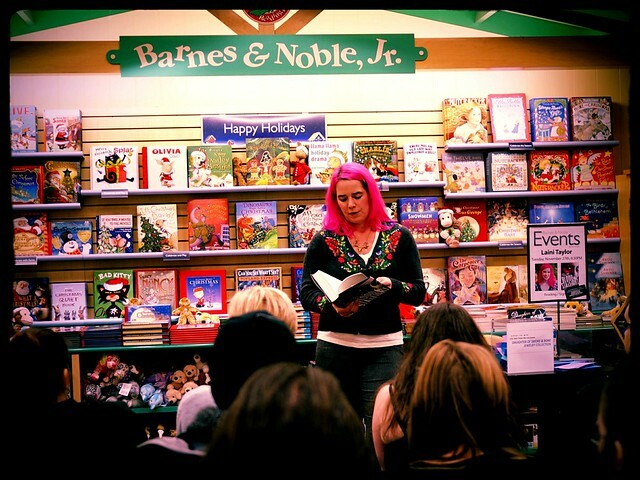 Laini seemed like a lovely person and her discussion of her writing process was fascinating. 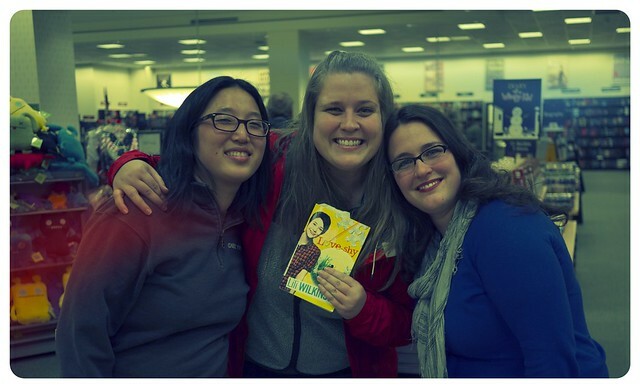 However, the highlight of the event was definitely hanging out with Flannery and one of her Goodreads buddies. Hooray for real-life connections with people who we know from the series of tubes that is the internet.